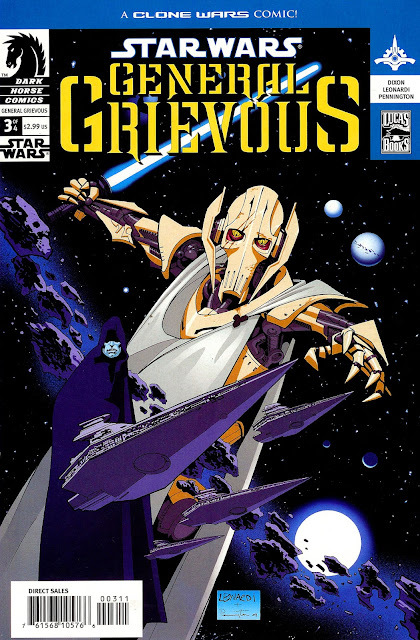 The third issue of the Dark Horse comic series, Star Wars: General Grievous, was published on this day back in 2005. General Grievous is both the protagonist and antagonist in a story which delves into the backstory of the supervillan and the hatred he has for the Jedi Order. The four-part comic series concentrates on Grievous' story prior to the events of Star Wars: Episode III - Revenge of the Sith. The first issue was released before Episode III hit cinemas on March 15, 2005 before concluding on July 20. The 24-page issue was written by Chuck Dixon, a veteran comic book writer known for his works on Marvel's Punisher and DC's Batman, Robin & Birds of Prey. The comic series is now a part of Star Wars: Legends, formerly known as the Expanded Universe. Disney and Lucasfilm agreed to retcon fictional background stories of the Star Wars universe, outside the original six films produced by George Lucas and certain other material such as Star Wars: The Clone Wars created before April 25, 2014. In October 2005, the Grievous series is listed in Del Rey's The New Essential Chronology , a 256-page reference book, which is the eleventh book in the Essential Guide Series. What is your favorite villain comic series in the Legends universe? Let us know in the comments below.